8. ID tag or in summer months fly tags in both ears with a number for ID. We have been doing part of our cattle with the new vaccine for MYCOPLASMA. This has become a serious problem for feeder calves. Vaccines are available and tests are still being run on results. All cattle are hand fed grain every morning. Each calf gets roughly 1 1/2 to 2 pounds per day,watched to see that they all eat,or are pulled and treated. All cattle run outside year round on legumes,orchard grass and a little fescue. During winter months or dry years hay is added,large round bales or square bales. Cattle are backgrounded for minimum of 30 days up to 60 days depending on size or if on order for some one before selling. Cattle are turned out in April and run until September or October. Cattle are sold to farmers in Kansas,Nebraska,Texas,Indiana,Northern Ohio and in our auction market. We own 350 acres in Highland County all in grasses. We do no crops. Most water supplies are developed springs with each field having water. We also have a backup of county water when needed. Our springs run into concrete troughs or troughs made from large industrial tires cut in half with concrete added to the bottom. 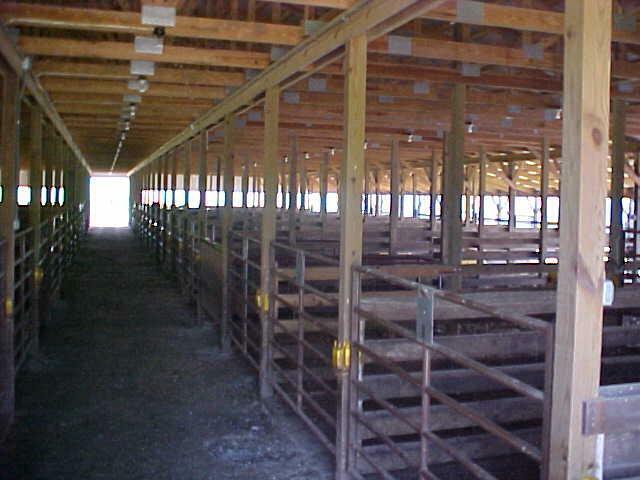 Feed is fed in poly troughs with enough feed space so each animal can eat. Mules or Gators are used to round cattle up for feeding and also haul the feed. Feed is crimp corn,34 baby beef,all natural protein pellets and molasses mixed at local mill and stored in grain bins. Feeder facility is 120x200 complete with a treatment chute, loading and unloading ramp and scales. There are 48 pens with water and hay feeder access in each.